Anatomy Of Habit is the brainchild of noise icon Mark Solotoroff, and Ciphers + Axioms marks their Relapse Records debut. Two monolithic tracks of heft and crush, combining vast post metal riffs and noise rock menace, make one of this year’s most interesting releases. The band has that talent for putting you totally at unease. The rich, poetic spoken word of the creeping, hypnotic intro to Radiate And Recede builds into a looming wall of thick guitar. The vocals get more agitated as the piece moves, layering crushing Neurosis riffs over slow, pounding drums. There’s some cool dirge riffs around the five and a half minute point, that roil and sway like a stricken ship. There are softer moments too, where the layers of gloom are stripped away for barely a minute before some grinding faster riffs appear. The song builds into a crescendo of crashing riffs, where the vocals become almost like an impassioned preacher, then it drops away to begin again. There’s a beautiful sense of ebb and flow, and the title encapsulates the song perfectly. Second track Then Window is the slightly longer of the two, and opens with squalling feedback that builds into a juddering riff fest. It then descends to a more melodic and gentler passage, while not necessarily more mellow, definitely adds variety into the mix. There’s something mesmerising about Solotoroff’s vocals on this track, that baritone vocal sounding somewhere between the croon of Maynard James Keenan and the more eccentric style of David Tibet. The repetitive nature of the vocals in this track, particularly the album title refrain, is very effective while the music swells and fades behind him. When that part comes to a close and it becomes just instruments, there is more than a hint of Jesu peering over this. It’s a perfect moment of calm, tranquil and ethereal. It bleeds atmospheric all over the next 7 or so minutes, a droning buzz saturating subtle melodies that seep out of the murk. It finishes off the record perfectly, and it’s almost saddening when it finishes. Ciphers + Axioms is a strange beast. 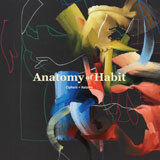 Equal parts atmospheric droning beauty and crashing, riff heavy goodness, Anatomy Of Habit has created something rather good here. If you like Neurosis and Swans, but like a nice slice of relaxing drone in there too, this could be for you.